Chex Mix Review from S.A.F.E. For years I have made snack mixes for my kids which would be milk, egg and nut friendly. Easy to do, as long as I had a variety of options on hand. I recently found one that my kids love. No specialty stores needed. Even better, NO specialty prices to shock you. You can purchase this at your local grocery store. They don't promote being nut-free, dairy-free or egg-free, but there isn't a trace of any of these items in their ingredients. 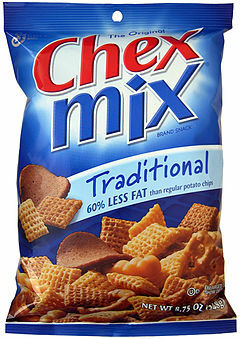 Traditional Chex Mix, distributed by General Mills. 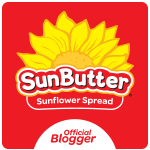 Ingredients include: Enriched flour (wheat flour, niacin, iron, thiamin mononitrate, riboflavin, folic acid), Whole Wheat, Degermed Yellow Corn Meal, Vegetable Oil (soybean and/or rice bran), Sugar, Partially Hydrogenated Soybean oil. Contains 2% or less of: Salt, Rye flour, Maltodextrin, Yeast, Barley Malt Extract, Color Added, Baking Soda, Spices, Dextrose, Distilled monoglycerides, Malt Syrup, Calcium Carbonate, Trisodium Phosphate, Autolyzed Yeast, Yellow Corn Flour, Onion, Garlic, Hydrolyzed Soy Protein, Natural Flavor, Disodium Inosinate, Disodium Guanylate. Freshness Preserved by BHT. It states on the packaging: CONTAINS WHEAT AND SOY INGREDIENTS. If you're already a fan of Chex cereals, pretzels, and/or bagel chips, this snack mix will become an easy favorite to have at home. 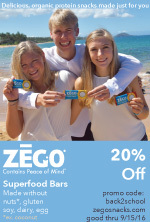 This is great to throw in your kids school bags for school snacks or classroom snacks. I still prefer making my own healthier snack mixes, but this is a keeper in our house for a snack that easily pleases many, not just the allergy fans.